Shiny “dons (Japanese damask)” covered with embroideries all over showing a picture of the shrine and the torii (gate), the traditional cow carriage of Aoi Matsuri and seasonally scenes of the shrine garden. The embroideries were finished carefully, stitch by stitch by hand. 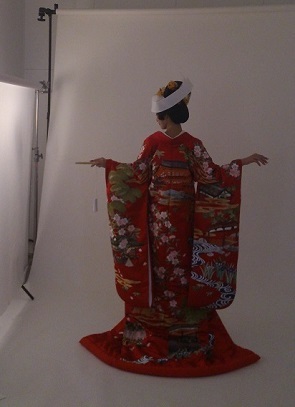 “Irouchikake (kimono with colors & patterns)” which you can try at LST “Austria Salon”. This is also a very gorgeous kimono with lots of gold yarns used, yet it also looks chic and sophisticated. We had a photo shoot of the wedding costumes at our photo studio today. 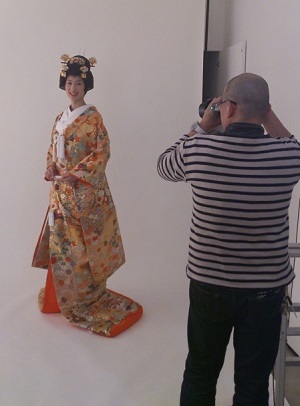 The photographs of kimonos we shot today will be introduced on our website soon. We cannot wait to show them to you, as they are really beautiful. Thanks for the cooperation to all the people who were involved in the shooting today!